World famous since the movie “Baraka” brought it to the attention of people worldwide, the monkey onsen is a popular trip from Hakuba. 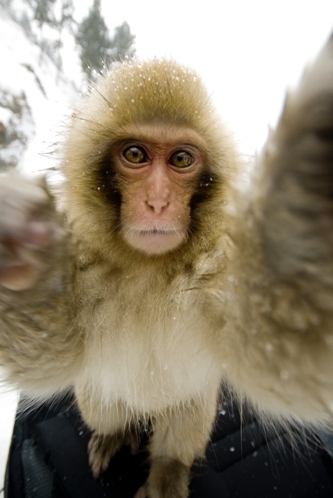 A troupe of the most northerly monkeys in the world hangs out in a natural hot spring for most of the year. There are about 200 monkeys at the spring and you can walk around surrounded by monkeys going about the daily routine that monkeys do! Bickering, playing, posturing, running around in the snow or just chilling out in the onsen. Great trip! PROS: No hassle. Comes with an English speaking guide, great lunch in Obuse village and a visit to Zenkoji. PROS: Go at your own pace any day of the week. No Big Groups. Save money! 1. )Take the bus from Hakuba Happo bus terminal to Nagano Station East Exit. The bus, taxi, or tour will drop you off at the car park about 40minutes walk away from the actual park entrance. Walk back along the road and follow the monkey pictures to find the start of the path. It’s a beautiful walk, but can be snowy or cold, so dress appropriately! Proper snow boots are recommended. Park Open Year Round. November-March : 9:00 – 16:00 April – October: 8:30-17:00 Mon-Sun. By Taxi: It’s also possible to take a taxi directly Kanbayashi Onsen Guchi..
By Car: Get off the Joshinentsu Highway at Shinshu Nakano I.C. Follow Route 292. Follow signs that lead to Siga Heights. Drive the road to Kanbayashi onsen and park the car in the toll parking lot. It’s about a 30 min walk to Jigokudani Yaen-koen entrance. In Nagano city it’s easy to find the Zenkoji temple. There are great traditional restaurants and shops selling sake, pottery, stationary etc. along the way to the temple.